It took some time for 7 th and 7 th to develop into everyone’s go-to skate spot. Our first visits required a lot of sweeping as the ground was covered with tiny rocks. And there wasn’t much to offer besides the very smooth ground. The big turning point came in the summer of 1995. I won a contest to have a group of professional skateboarders visit Polson on their nationwide summer tour. They wanted to come skate and put on a demo where they would showcase their skills for all of us. I felt we needed a proper venue for this. So with help from the other skaters in town, and their dads with power tools, we cobbled together some ramps for the pros to skate. The demo was a success in all of our eyes. One of the pros even made the front page of the Lake County Leader! That was the highlight for us and 7 th and 7 th for that summer. The visit from the pros and building ramps sparked a lot more ramp building. By the summer of 1996 several of the skaters in town had small collections of ramps at their houses. As a way for all of us to enjoy skating these ramps, a weekly tradition started of bringing all the ramps to 7 th and 7 th . These were some of my favorite days of skateboarding. It felt like we had our own skatepark – even if it was for 1 day a week. That same summer I opened a small skateboard shop called FGD Skate Shop. As a way to promote the shop I organized a skate jam. The skate jam was an expansion of our weekly ramp meet up. I invited skate friends that I had met from all over western Montana. 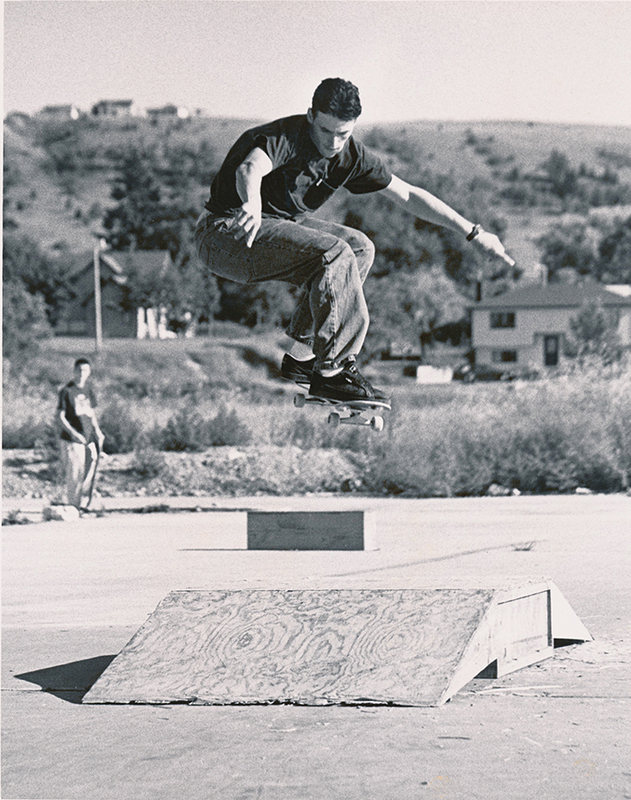 The skate scene was so small back then that it felt like the perfect way to connect all of us, do some skateboarding, hang out, BBQ, and make new friends from across the state. And it turned out to be a hit with everyone that came. After that summer, we felt like we had established a good presence at that empty lot. Everyone’s building skills had improved and we started building bigger and better ramps that we felt we could leave there permanently. It was around this time that the park became more that just skateboarders contributing. Chad Eslick started building ramps geared toward BMX bikes. This lead to more kids coming to skate and ride and with that came more community support. The staff at Woody’s was always helpful with supplies, I often visited Ace Hardware to get their off-color discounted paint, and many skaters’ parents let us use their tools and garages for construction. 7 th and 7 th was a labor of love. Winter was always hard on the ramps. So every summer started with buying wood and repairing ramps. The skate jam turned into a yearly tradition. Even when I was in college and beyond I would come back to Polson just to help contribute to the event. It was such a fun event that it spun off a BMX version as well. It’s so awesome to see the Skate Jam and BMX Jam continue on, year after year. It was heartbreaking when I heard the news that 7 th and 7 th was going away. I knew it was inevitable. We had built a skatepark on someone else’s land and it wasn’t going to last forever. But it was amazing to see how quickly the community rallied to build a new skatepark. 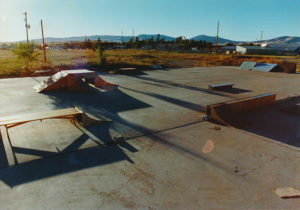 And what a skatepark it is! Dreamland constructed an excellent and challenging park. One that attracts visiting professionals on a regular basis, and it’s always awesome to open a skateboard magazine and see a photo of someone skating the park from those visits. 20 years ago I never would’ve have imagined that! 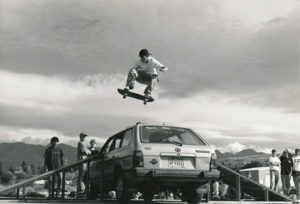 There’s that drive in us skateboarders that I mentioned before – for new and varying terrain. And I see it manifesting in the current group of skaters in Polson. 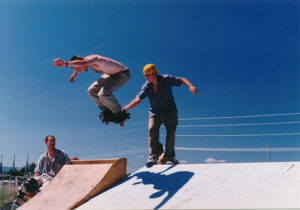 Their drive to add on to the skatepark is only natural and I hope it will inspire another generation to take up skateboarding and to continue on with the traditions we’ve all started in Polson.